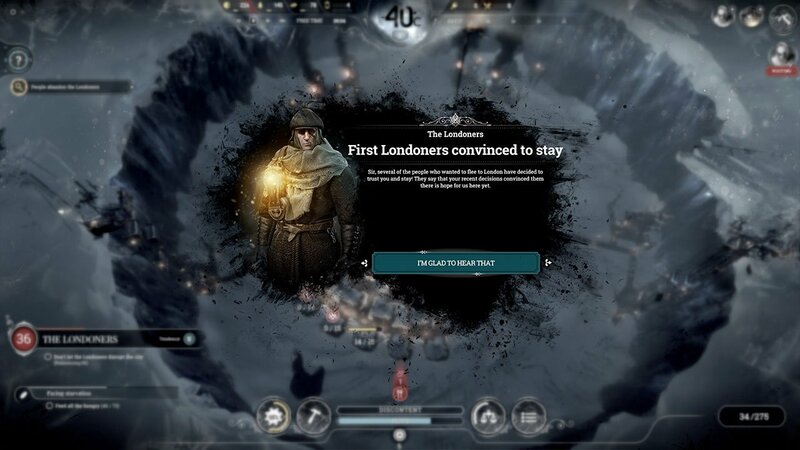 The Londoners are one of the first problems you face in Frostpunk around two weeks in. A group of people will decide they are heading to London in 15 days, and persuade a lot of people in your city to follow them. No matter what, the Londoners will persuade some of their friends and neighbours. That part is unavoidable so don’t stress. The next steps are to stop them each morning from persuading more. 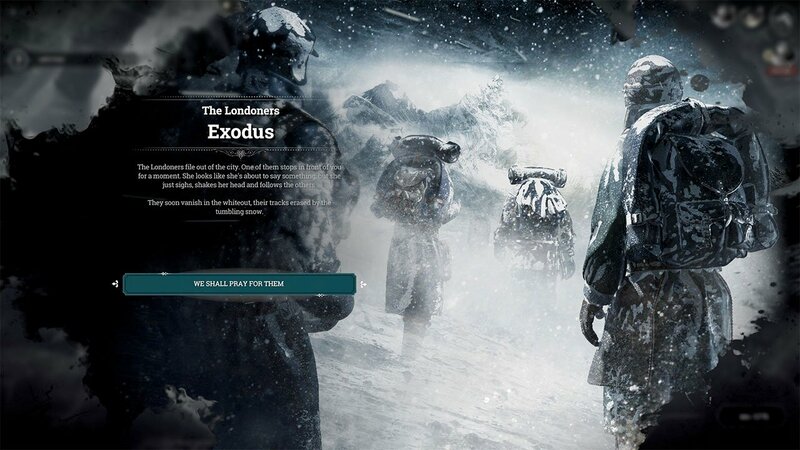 Don’t panic if the number of people joining the Londoners dramatically increases. You have 2 weeks to sort it out. For me, it usually goes up to 60 followers before it starts dropping again. They will do everything they can to persuade more people, such as organising protests, beating up guards and placing graffiti on buildings. The easiest way of beating the Londoners and stopping your workers joining them is by increasing hope and lowering discontent. Hover over each bar to see where improvements can be made. Workers may be complaining about cold homes, corpses on the streets or food rationing. Making your residents happy is one of the first steps to running a successful city. If you can, save some of the better laws for this stage of the game. Laws such as Child Shelters, Cemeteries and Radical Treatment can all raise hope easily. Building guard posts/temples can also help increase hope by using the provided abilities and giving workers a sense of security. Keep up to scratch on the promises you have made in the bottom left corner. If you fail to keep a promise, the discontent will increase, and the hope your workers have will massively decrease. Having a low hope will make people feel more eager to turn against you. Finally, make use of your abilities. Whether you have gone down the Faith or Order path in the Law Book, you will have a few abilities which will increase hope. Having your people gather and prey, or having guards conduct patrols can massively increase hope and reduce discontent. You can do it every couple of days too. When the time comes for the Londoners to leave, you will have a chance to convince the final ones to stay (if there are any left). build a prison and do a criminal sweep whenever you can, like the patrols from the guard towers, whenever you can. many people in poor health turn up, so you need 3 or 4 fully manned infirmaries and at least 2 care houses to deal with this. as all the refugees come in, you’ll have plenty of labour. always have a few houses ahead for when a lot turn up and you have to build a lot quickly.. build a second and later a third research center and alternate 24 hour working and you’ll get better upgrades quicker. good start tip: sign child labour law and get the kids gathering, that really helps early on. research beacon first and get a scout team out there (..and a second as soon as some more people turns up). then research, faster gathering, sawmill, steelmill, heaters and coal thumper, before you move to next level. also build hunters huts, 4-6, when they are upgraded to flying hunters they bring in a lot of food. btw my record is 653 people saved on a new home.